America’s First Lady kicked off her “Let's Move” campaign last week, aimed at eliminating “the epidemic of childhood obesity” in a generation, but is she biting off more than she can chew? Ever since Eleanor Roosevelt proved that a presidential wife need not keep herself hidden in the shadows of the White House, America’s First Ladies have been sticking to the tradition of promoting various social causes from Pennsylvania Avenue. Nancy Reagan, for example, had her “Just Say No” to drugs campaign that unfortunately got bogged down in a nasty “War on Drugs” deep in Latin America. Barbara Bush, wife of the 41st President of the United States George H. W. Bush, and mother of the 43rd President George W, spoke on behalf of dusty books and reading at a time when the world was just entering its Internet addiction phase. And perhaps most dauntingly of all, Hillary Clinton stumped for a national healthcare plan; sixteen years later, and during the most spectacular economic shipwreck since the Great Depression, Americans are casually bailing out the bankers (and their bonuses) at the very same time that the utopian dream of “healthcare for all” is slammed as Socialism. Now it’s Michelle Obama’s turn to leave her stamp in the annals of First Lady Big Ideas with her recently announced pet project of tackling US obesity rates. This is an idea whose time has certainly come. According to data from the Centers for Disease Control and Prevention (CDC), over the past 20 years there has been a dramatic surge in obesity rates in the United States. In 1985, America was more or less physically fit, with most states registering obesity rates less than 10% of the population (To view an interactive map from the CDC click here ). According to the CDC’s website, obesity is defined as a body mass index (BMI) of 30 or greater. BMI is calculated from a person's weight and height and provides a reasonable indicator of body fatness and weight categories that may lead to health problems. Obesity is a major risk factor for cardiovascular disease, certain types of cancer, and Type 2 diabetes. By 2008, just one state (Colorado) registered an obesity rate of less than 20 percent of the population. Meanwhile, thirty-two states weighed in at equal to or greater than 25%; six of these states (Alabama, Mississippi, Oklahoma, South Carolina, Tennessee, and West Virginia) tipped the scales with obesity rates equal to or greater than 30%. Studies show that approximately 60 million American adults are classified as being obese, with another 127 million being overweight. The hard, artery-clogging reality is that America does not have a weight problem. America has a corporation problem, which can be broken down briefly as follows: McDonald’s, Wendy’s, Burger King, Pizza Hut, Kentucky Fried Chicken, Jack in the Box, Taco Bell, Dunkin’ Donuts, Krispy Kreme, Subway, Chick-fil-A, Arby’s, Doritos, Cheetos, Fritos, Snickers, Pepsi-Cola, Coca-Cola, Mountain Dew, Sprite, 7-Up, Snickers, Mars, etc., etc, ad infinitum, ad nauseam. Eric Schlosser, in his best-selling book “Fast Food Nation: The Dark Side of the All-American Meal,” wrote that US consumers spent about $6 billion on fast food in 1970; just 30 years later, that number swelled to $110 billion. Indeed, it is almost impossible these days to drive through an American town and not hit a wall of fast food franchises. And then there is the ubiquitous corporate advertising aimed directly at those individuals suffering most from the fast food onslaught: the children. The Federal Trade Commission latest report showed that food companies spent $1.6 billion on marketing to children and teens in 2006. The overwhelming majority of those advertisements were aimed at promoting unhealthy items. Meanwhile, a 2005 study by the Center for Science in the Public Interest, a leading advocacy group on nutrition and health, reported that 9 out of 10 commercials on Saturday morning television were promoting fast food, sugary cereals and other low-nutrient products. Incredibly, many American students never have to leave the school grounds for their daily allowance of fast food: it’s being dished out by school cafeterias across the country, even in places surrounded by rich farmland! Perhaps the American First Lady should rename her weight loss campaign to: “Let’s Move… the corporations that pawn junk food out of town!” Admittedly it’s not as snappy, but it would likely be more effective. Will fast food go the way of big tobacco? Michelle Obama’s crusade against obesity may augur hard times ahead for the fast-food/junk-food industries, especially with the Democrats attempting to push through a national healthcare plan. In other words, the food industry may be compelled to rethink what they are providing to US consumers, otherwise they may find themselves in the same predicament as the tobacco industry. In the early 90s, big tobacco was forced to cough up billions of dollars to help states provide healthcare to the victims of cigarette smoking. In 2003, lawyers representing two adolescent girls, Ashley Pelman and Jazlyn Bradley, took McDonald’s to court on the charges of causing the girls to become obese. McDonald’s won the case and others like it, but if the trend toward obesity rates continues as they are, US courts may be forced to rethink where personal responsibility ends and corporate responsibility begins. In a different sort of lawsuit, actor and director Kevin Smith was forced off of a Southwest Air Flight over the weekend because he didn’t fit comfortably in the seat. Smith retaliated against Southwest with a barrage of Tweets (Smith reportedly has over 1 million followers) recounting the episode – “You [messed] with the wrong sedentary processed-foods eater,” Smith posted on Twitter. Smith hit upon one of the major obstacles that is certain to derail Michele Obama’s efforts: our sedentary lifestyles. People no longer perform manual labor in the fields, or sweat in a factory the way they used to. Increasingly, we have all become workers in a “knowledge-based” economy. Yet for all of the knowledge out there, we have yet to figure out how to stay fit and trim while sitting at a computer all day. But in the meantime, the US economy can at least guarantee continual profits in the “weight loss” industries, such as the latest diet fads, exercise equipment and spa memberships. What would a plan out of Washington be, even from the popular First Lady, without some sort of conspiracy theory to explain it? Here goes: As the American war machine shifts into high gear (US President Barack Obama recently announced a 30,000 troop surge into Afghanistan), the US Army recently announced it would shelve their “don’t ask, don’t tell” rule. 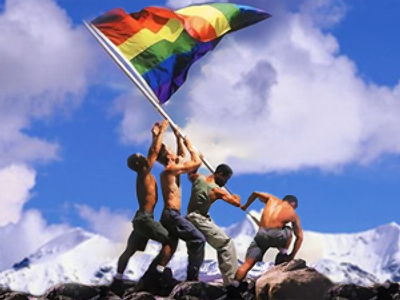 As a result of the changes, it will be perfectly acceptable for gays and lesbians to be “open” about their sexual preferences while performing their military duty. This also means that soldiers will no longer be qualified for discharge from military service due to their alleged sexual preferences (it is no secret that many service men and women used this clause on sexuality to get out of military service, not to mention combat). What does this have to do with Michele Obama’s “Let’s Move” program? Well, according to retired US Army General Johnnie Wilson, as quoted by the Financial Times, 75% of Americans at the prime ages for military recruitment – 17 to 24 – are unfit to serve their country, and the main reason is their weight. Given America’s protracted wars in Iraq and Afghanistan, these are numbers the US military, not to mention American society, simply cannot afford. What’s new in presidents’ wives fashion?